Bitcoin and the blockchain – time to invest? Today’s post is an introduction to Bitcoin and the blockchain. Why is Bitcoin a good thing? 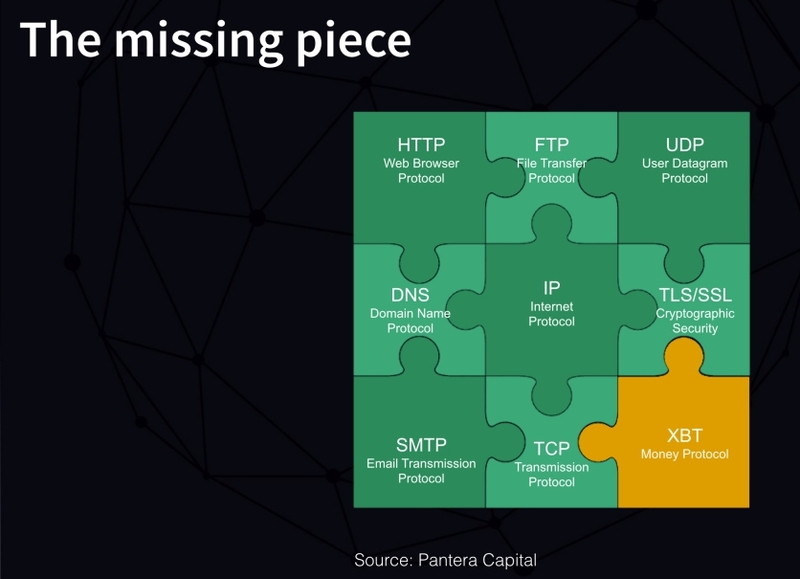 Bitcoin is not about making money digital. Money is already digital – only 3% of pounds and dollars exist as paper or coins. We use online accounts, we have supermarket rewards points and air miles. We have Oyster cards. We use (contactless) credit cards. Some of us use our phones. They’re all tokens that can be exchanged for goods or services. But they all use a middleman – a bank, a credit-card firm, London Transport or a supermarket. Cash on the other hand has no middleman – I can just hand it to you. It is private, immediate and cheap to use (therefore ideal for low-value transactions). It’s not so great for large purchases though – say for buying a car or a house. 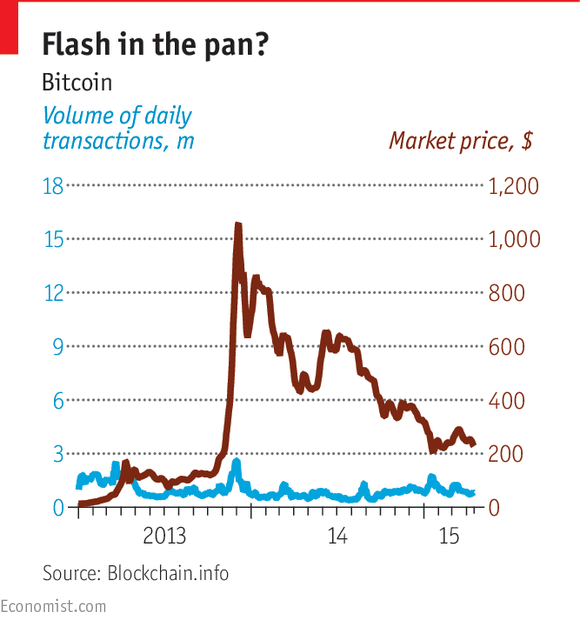 Bitcoin is digital cash – (almost) immediate, cheap to use (it costs about a third of a penny) and private. It also scales well (if you’re prepared to take the risk). It’s also like the internet of money. 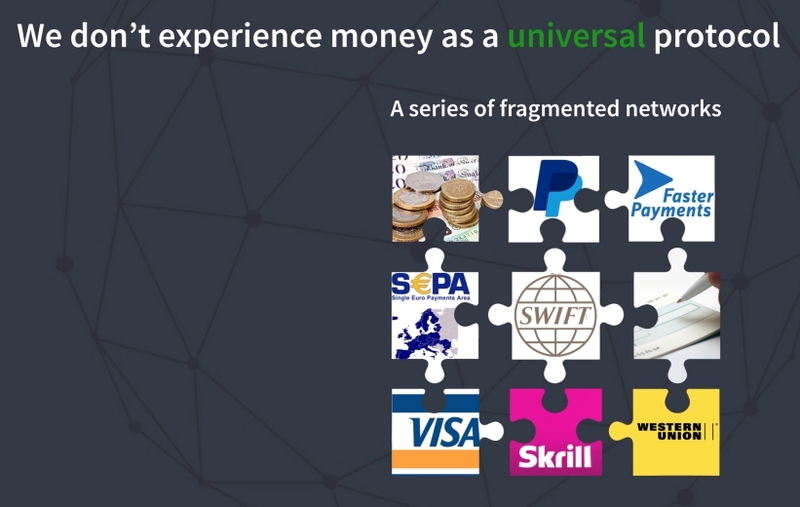 Money is currently fragmented, just as telecommunications was before the internet (and in particular, the world wide web) came along. Now everything can travel the same way, and in principle, the same is true of Bitcoin – it could be used for all financial transactions. It offers a unified protocol. Bitcoin was created in October 2008 by an unknown person calling himself Satoshi Nakamoto. Nakamoto was interested in cryptography, and Bitcoin was described as “a new electronic cash system that’s fully peer-to-peer, with no trusted third-party”. The idea was a currency with no government backing. And possibly with no banks or credit card companies, since they are traditionally the trusted third parties. It’s possible that the underlying “blockchain” technology could prove more useful than Bitcoin itself. The blockchain is an enormous ledger that keeps track of who owns how much Bitcoin. Coins do not exist, there is just a list of who owns them, and who has owned them in the past. This sounds like traditional banking, except that a bank’s records are private and held within the bank. The blockchain is public and anyone can download a copy. There is security to hide personal identities, but the transactions are public. The Bitcoin sequential blockchain solves the problem of “double spending” that had stopped earlier forms of digital cash. The problem with keeping all the transactions in the blockchain is that it keeps growing – new “blocks” of transactions are constantly added to the end of the chain. It’s currently many thousand times the size of the Bible. Rather than a central banker or credit company, a network of around 10,000 computers validate the transactions by voting on them (through the solving of complicated mathematical problems). This is a slow process, and takes a lot of power. 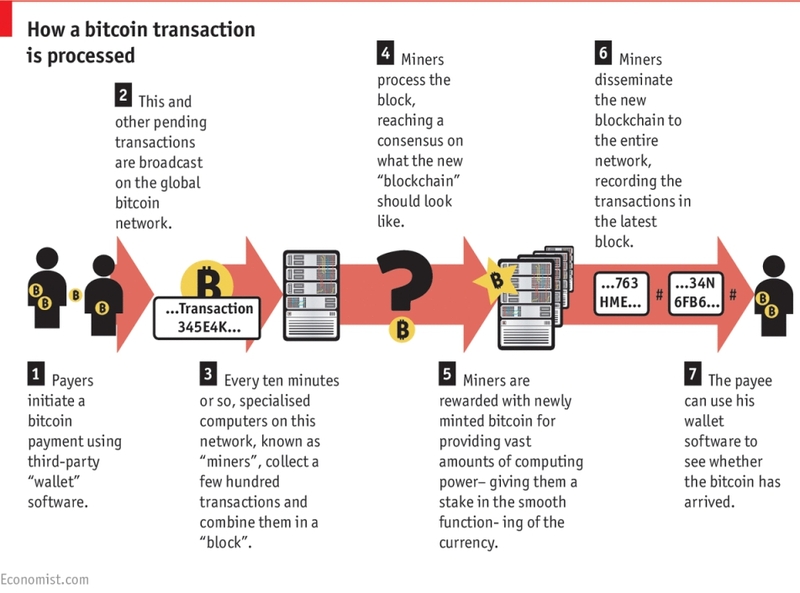 Bitcoin can only process 7 transactions per second, compared to tens of thousands for Visa. Users sometimes wait 30 minutes for a transaction to be validated. When a consensus is reached, the transactions are added. To tamper with the system, the majority of computers in the network would need to be compromised. The validating computers (often large dedicated server farms) are known as miners, since they are rewarded with new Bitcoins. The security of the blockchain process itself is undermined by the need to move real-world currency in and out of the Bitcoin system. The exchanges and “wallets” this requires have proved much less secure. Bitcoin is unlikely to take over as a long-term store of value. This is a somewhat misleading definition in any case. Income producing assets (stocks, property) will produce higher returns over the long run than gold – they are a better long-term store of value (purchasing power). It’s interesting in this context that Bitcoin’s perceived high volatility should work in its favour here. Financial assets have a trade-off between expected returns and volatility. People will only hold volatile assets (usually stocks) if they think that the long-term return will be higher. Over the short-term, volatility works the other way. A volatile asset is a poor short-term store of value. 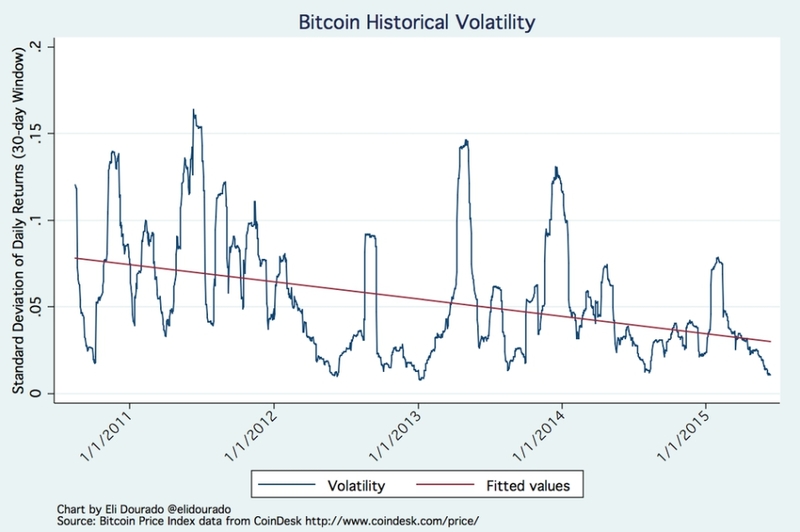 This perceived volatility is hurting Bitcoin’s adoption. This is not perfect for people in the UK or US, but for certain areas of the world (Argentina, Zimbabwe, Greece) this level of volatility would already be useful, were the necessary infrastructure in place, since it is lower than the volatility of the regular currency. So there is potential for Bitcoin to become a short-term store of value in some countries at least. The other role for Bitcoin relies on the almost instant settlement of transactions as discussed above. A credit card bill will be paid six weeks after the transaction, but Bitcoin is like cash. Except that it’s cash that can be used online without an intermediary. Ignoring the privacy issue for a moment, the chief drawback of using intermediaries is that it limits the pool of people you can transact with. Both parties need a relationship with the same intermediary. With Bitcoin, though each party will use an intermediary to convert their local currency into Bitcoin, it does not need to be the same intermediary. This will help people without credit histories suitable for approval by western agencies. Two and a half billion adults in the world are considered to be unbankable, and are therefore unable to fully participate in the global economy. Young people and people in emerging economies might use local intermediaries with whom they have a physical, face-to-face relationship. This in turn might lead to an increase in direct transactions between rich countries and less developed ones. It might also lead to machine to machine – robot to robot – transactions (see below). Goldman Sachs calculated that in 2013 $550bn in remittances were sent around the world, generating $49bn in fees. Using Bitcoin would have saved 90%+ of these fees. Micropayments could end email spam. Spam depends upon the spammer being able to send as many emails as possible for as low a cost as possible. If sending an email involved a micropayment, there would be no effect of those of us who “only” send a few dozen emails a day. But spamming would become expensive. It would also probably mean the end of free online content. Videos, news and even blogs would all involve a small, automatic one-click payment to view. Tips to content producers might become a thing (yay!). It’s not just financial transactions that involve middlemen. To send a message, I have to use Gmail or Twitter of Facebook. These companies have access to my message, and use it (at a minimum) to sell advertising . The blockchain could be used to send secure messages without a middleman. To take it a step further, Trustronic is a blockchain-based mobile-phone operating system (still under development). The blockchain could also change the way we register ownership of physical and financial assets. Nasdaq is looking at this, as is the Honduras land registry. Property ownership is a key driver of development in emerging economies, and this could help. If identity were to be proven using blockchain, then online reputation (think TripAdvisor reviews, or eBay rating) would become vital in allowing you to undertake transactions with strangers. It would replace your credit score and credit card limit. There is even discussion of using blockchain applications for voting systems. No need to stay up late for the count in that case. This could also lead to the widespread use of referenda on individual issues, rather than the wholesale adoption of a party manifesto. Bitcoin hasn’t taken over yet. You can use it on-line and in a few coffee bars. There is a crowdsourcing funding platform, but your mother doesn’t have a Bitcoin wallet.4 Cash and credit cards (contactless, sometimes) are still king. Pay by phone is the new kid on the block. It doesn’t help that the value of Bitcoin is unstable. 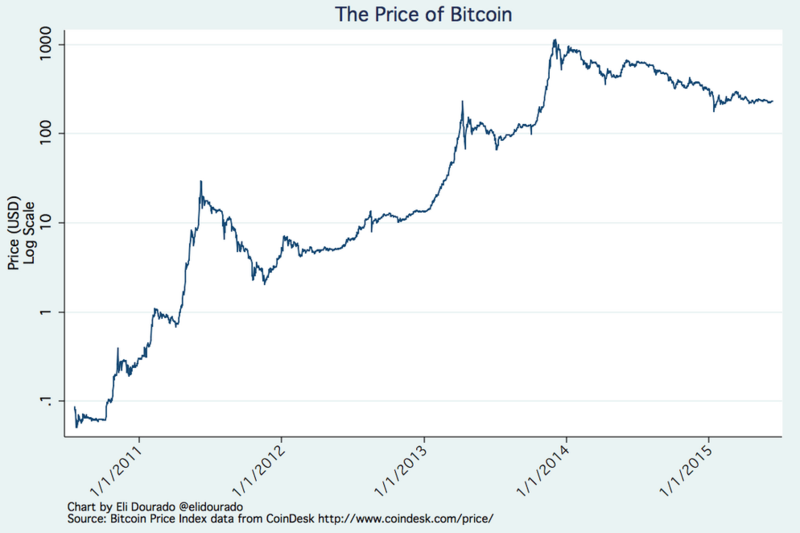 From 2008, the Bitcoin price took until 2011 to break through $1. It hit $30 before falling back, then hit $200 in 2013. It then fell back under $100 before the famous spike through $1000 in November 2013. Since then it has fallen back to just over $200. Having said that, the price looks a little more stable against a log scale. It is generally agreed that the lack of a “killer app” for this envisaged “internet of value” is one thing that is holding it back. At the same time, few of the applications that dominate the world wide web (Facebook, Google Netflix, blogging etc.) would have been conceivable in the early 1990s. Even before that, email has done a lot more than replace stamps and envelopes for occasional letters. Ethereum aims to verify if a party to a contract has fulfilled its side of the bargain. These “smart contracts” would allow robots to go into business for themselves (eg. a server renting out capacity, and using the profits to upgrade itself); smart contracts would also have serious implications for the legal industry. The second thing is that although a Bitcoin is still worth more than $200, you don’t need to but a whole one. Bitcoins trade fractionally, so you can just by £20 worth if you like. We can rule out mining them. The days of running a mining server in your bedroom are over. Industrial amounts of processing are needed now. You can earn them for services (instead of being paid in pounds). Or you can buy some. Let’s look at how you buy some. That in turn will show us how to earn them. Get a web wallet from coinbase.com or blockchain.info. Convince a friend to sign up too, so that you can practice with a few safe transactions. If you can’t find a friend who wants to do this, and you want to practice with me, just let me know. Find a physical location that accepts Bitcoins, and buy yourself a cup of coffee or something. In London, physical locations are mostly east of Soho. The nearest place to me was a distillery in Battersea, but I think that was online only. Next closest was a barbecue pub (?) in Charing Cross. Once you have a wallet, earning Bitcoins is as simple as providing your wallet address to the person who wants to pay you. You have to decide yourself whether this is a good time to invest in the market. From the chart the Bitcoin price looks to be in decline at the moment. 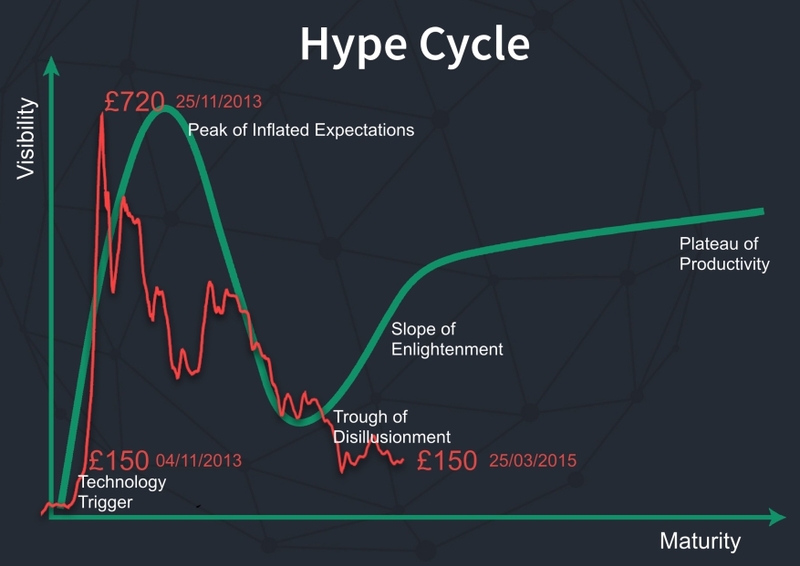 Perhaps it all depends on whereabouts you see Bitcoin on the hype cycle. 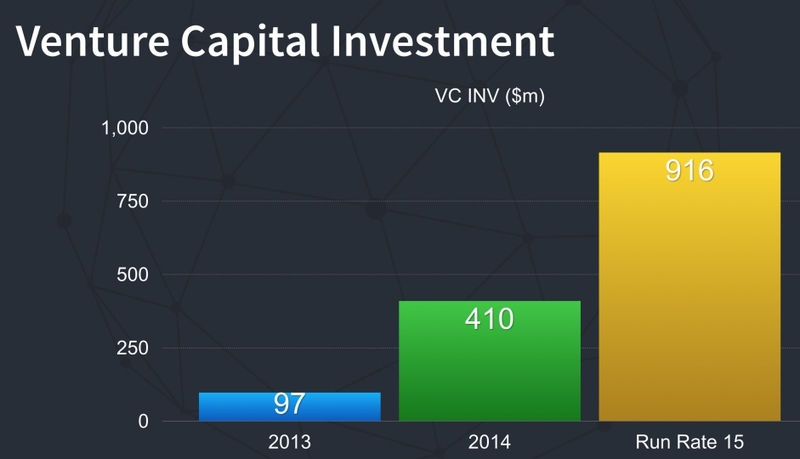 There’s certainly growing venture capital interest, perhaps comparable to internet companies around twenty years ago. I must also mention Bitstocks, who presented at the Alternative Investing Show, May 2015. For security, all accounts are multi-signature with 2-factor authentication, Bitcoins are held in “deep cold storage”,((I believe this amounts to offline) and “bank grade” encryption is used. 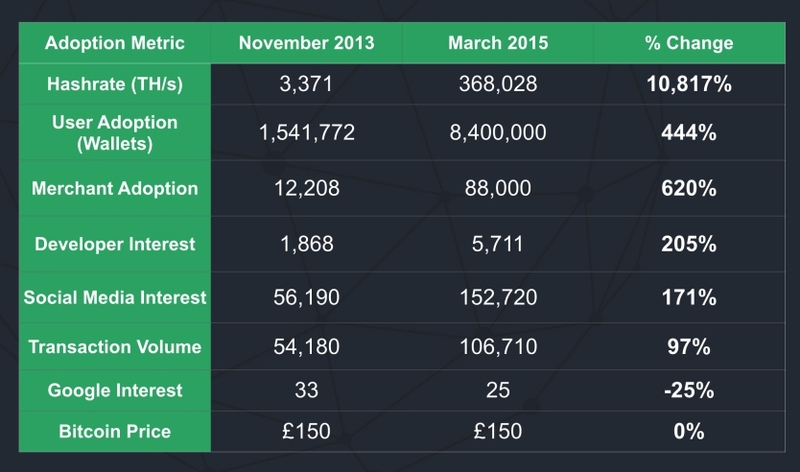 Next story Peer-to-peer lending – time to build a portfolio? 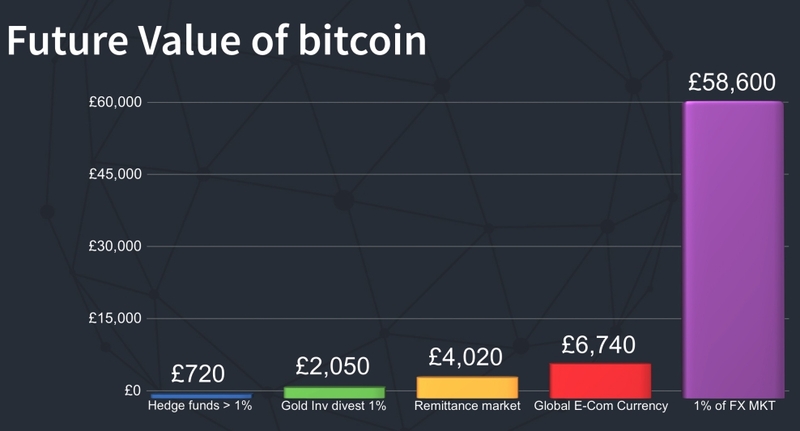 7 Circles > Passive & Assets > Assets > Bitcoin and the blockchain – time to invest? When a man with money meets a man with experience, the man with experience leaves with money and the man with money leaves with experience.